Vegas Massacre – Mental Illness As Motive? The democratic house members who are not attending the upcoming Presidential inauguration are throwing an adult version of a temper tantrum and displaying unsportsmanlike conduct at the least, and at worst they are demonstrating warring behaviors within our country exacerbating division and hatred while overtly displaying a lack of leadership. Holidays, Men, and Politics – Intertwined? 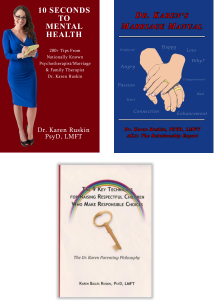 Dr. Karen has saved and helped thousands of couples enhance their marriages, families resolve their conflicts, and individuals make significant life shifts for more than 20 years as a Marriage and Family Therapist, and she continues to do so.